Odd Mom Out, one of the funniest comedies on TV, is back for its third season July 12 on Bravo. 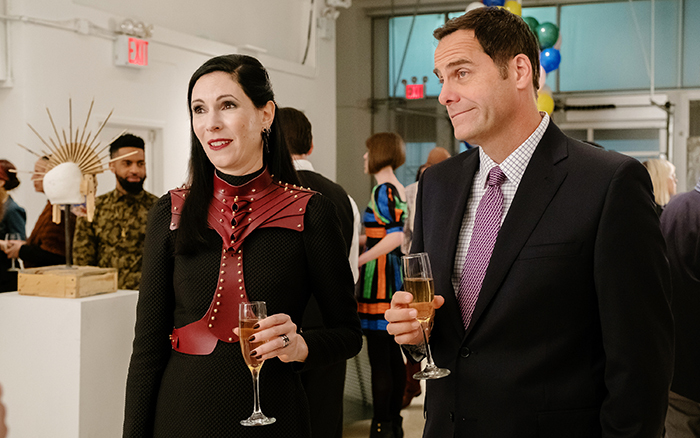 The hilarious Jill Kargman, who is Jewish and is married to a Jewish guy in real life, is not only the star, but is also the creator of this show. Kargman’s Jewish character Jill Weber is in an interfaith marriage to Andy Von Weber (Andy Buckley) on the show. Last season ended with the revelation of a Ponzi scam that wiped out the fortunes of some family members and friends, and the good news is Jill and Andy didn’t have the money to invest in it. The bad news: Andy’s overbearing mother (Joanna Cassidy) moves in with them. But she gets selected for a jury on a murder case and then is sequestered, so she won’t be around too long. Guest stars this season include Dave Navarro and Wendy Williams, playing themselves, and Christine Taylor in a new regular role as the über-homemaker elder sister of Jill’s snooty sister-in-law Brooke (Abby Elliott). Brooklyn Nine-Nine star Andy Samberg loves spoofing documentaries in the name of comedy, as he did with the movies Popstar: Never Stop Stopping and 7 Days in Hell, taking on pop music and tennis respectively. On July 8, he skewers another sport in the HBO mockumentary Tour de Pharmacy about bicycle racing, specifically the 1982 Tour De France and the competitors that supposedly raced heavily under the influence. Samberg, who is Jewish and in an interfaith marriage to musician Joanna Newsom, stars in an ensemble that includes Orlando Bloom, Will Forte, Freddie Highmore, John Cena, Mike Tyson, Kevin Bacon, James Marsden, Phylicia Rashad and Daveed Diggs. Diggs (Hamilton, Black-ish, Unbreakable Kimmy Schmidt) is the bi-racial product of an interfaith marriage (Jewish and Caucasian on his mother’s side, Christian and African-American on his father’s). “When I was young, I identified with being Jewish, but I embraced my dad’s side too,” he has said. The in-demand actor-rapper will appear with Julia Roberts and Owen Wilson in the November release Wonder, executive produce the ABC fall sitcom The Mayor and star in Snowpiercer, a TNT series based on the 2013 futuristic feature about survivors of a climate disaster living not-so-harmoniously on a train. Former teen actor Josh Peck (Drake & Josh), also known for voicing Eddie in the Ice Age movies and comedies like the sitcom Grandfathered, has a new role: husband. Peck, 30, who was raised in his mother’s Jewish faith (he doesn’t know and has never met his father), wed longtime girlfriend Paige O’Brien in Malibu on June 17.